Pros can now add video to tags too? 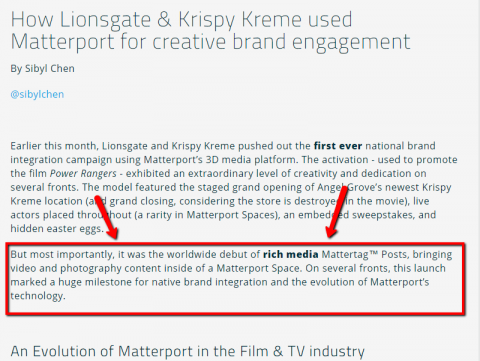 I thought the Krispy Kreme example was purely an in-house example at the moment but maybe I misunderstood. Would be great if I was wrong! Thanks, this is awesome ... Looks like it's still in Beta but I'm hoping this will be rolled out for us all to use very soon! Thank you for posting. Good find! We'll all super-excited about this. Seems like the "worldwide debut of rich media" was by 3rd party developer @Metroplex360 with his MatterPlus app. @DanSmigrod Hi Dan from what @Metroplex360 said he did do a proof of concept for the tour but the final product was through Matterport. What's wonderful is that I can soon remove this feature from my work. Matterport did this very well by the way. The mattertag position adjusts nicely for the embedded content so that the matter tag doesn't open up off screen. My hack did not compensate. I can once again day that when Matterport add the features, they make sure they get them right! @Metroplex360 Well done again, you continue to amaze us by what you can do! Is there any word on when the features are actually available? @nat_vanveen Matterport just updated Showcase to v2.16.6 and did not include this feature. If history repeated, Matterport would roll this feature out to BETA Testers under NDA and then roll it out after the testing period. As of this moment, I've heard nothing about a BETA test. @nat_vanveen me too. My clients will go nuts with this. Hi @Metroplex360, we are following these new features closely. I hope this will be integrated soon in MP, also allow us to add HTML code in iframe so we can integrate more than video and text. I have a client that even wants to hide a wheel of fortune in the space to play out tickets and goodies. - mattertags by category with custom png icons, search bar and mattertags on floor plan option. Useful for AEC.